Following up on the previous post on Best Practices, I want to talk about some things you should do and things you should NOT do. As you probably know, there are always some Do’s and Don’ts when you embark on almost anything! List Building is no different. 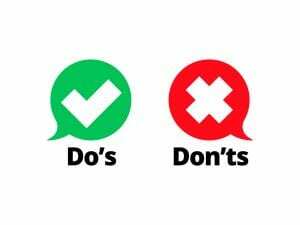 Follow the following Do’s and stay away from the Don’ts! Keep Sign Up Forms Simple: Reduce your sign-up forms to two fields: name and email address. You can always ask for more information once you engage with subscribers! Send Welcome Emails: You can keep your business top-of-mind by sending welcome emails to email subscribers right after they sign up. Segment Your Lists: Keep your email subscribers engaged until they convert into customers by segmenting them into different lists depending on which stage of the customer journey they are at. Use Email Automation: Email marketing automation will allow you to create customer journeys to nurture subscribers, keeping them engaged with your lists even after they convert. Don’t Go Overboard With Pop-Ups: Don’t bombard website visitors with sign-up pages and pop-ups left and right. Instead, use targeted sign-up forms that offer upgrades or offers related to the content on the page where visitors opt in. Don’t bombard website visitors with sign-up pages and pop-ups left and right: Instead, use targeted sign-up forms that offer upgrades or offers related to the content on the page where visitors opt-in. Don’t Buy Lists: Contacts obtained from paid lists didn’t opt-in to receive your offers, so they’re very unlikely to open your emails, let alone convert. Don’t Import Lists Without Permission: Importing lists from your social media databases or personal email contacts will easily get you flagged as a spammer, as none of those leads have consented to receive your marketing emails. Don’t Send Too Many Emails: Keep your subscribers in your lists by not sending too many emails in short periods of time, which encourages opt-outs. Great lists Paul, thanks for all your helpful tips. yeah i probably need to back up and read earlier post. Love the esticates (hmm the way the page looks with the highlites and spacing) White space is my friend and keeps me reading. Reading the previous posts will provide you with some more info on this topic. Don’t Go Overboard With Pop-Ups: Click here to access the “List Building 2019 Success Kit” Full Training!! Yes, I need to concentrate on building my list more this month!! And to nuture my list and make those on my list feel I’m that comfortable friend they can confide in and learn from!